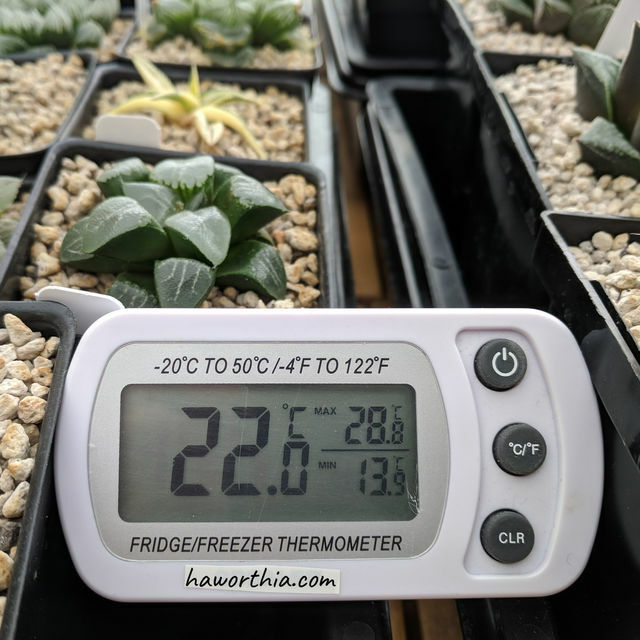 Haworthias grow best in a subtropical area with mild to warm winter days (14~25°C) and cool to cold winter nights (4~10ºC). When the temperature falls below 4°C, plants may suffer from freezing injury. In summer, Haworthias prefer warm to hot days (25~38ºC) with mild to cool nights (14~20ºC). They do not like overnight temperatures above 24ºC. This is because their collection of carbon dioxide for photosynthesis at night can be inhibited by high temperatures. In spring and fall which have warm days and relatively cool nights, Haworthias enter their peak growth periods. The plants are fully active and their water and nutrient uptakes reach the peak. These are also the best times for various propagations and cares. A thermometer that records 24 hour high and low temperatures is very useful.